“[title of show]” is based on a very simple premise. So simple it may seem almost silly and trivial at first. But it isn’t. Here’s the plot: best friends Hunter and Jeff want to submit a musical to a festival in New York. They have three weeks. Very soon, they begin to realize that the only real story they have is the one about them writing a musical to submit to the festival. (The word “festival” a la Into the Woods, is mentioned–funny!) As these two guys keep writing, a few silly plot lines emerge. See the song “Monkeys and Playbills” for instance–a hilarious piece with action and laughs and lots of twists. 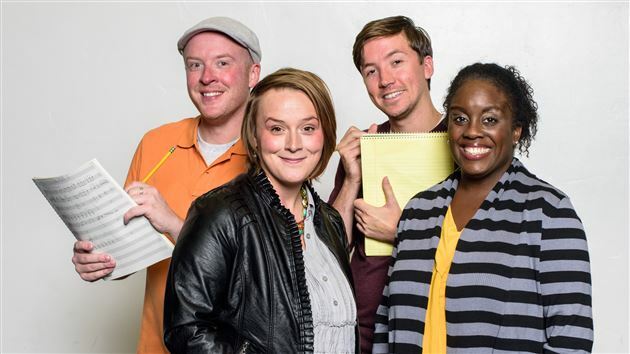 So “[title of show]” tracks the progress of Hunter (played by Austin Archer) and Jeff (played by Jonathan Scott McBride) and their friends Heidi (Megan Shenefelt) and Susan (Dee-Dee Darby-Duffin), who’ve been invited to be part of the production. What IS the production? This is what’s so fascinating about “[title of show].” Yes, we see the minutiae of Hunter and Jeff’s process: at times it’s hilarious and at times, it’s rather mundane. But it’s always totally believable and relatable. I think anyone who’s ever tried to write anything–music, a book, a theater review (meaning yours truly–right now), using the creative process can relate to this production. As I discussed with Caden, my 18-year-old son, who attended with me, we realized this show is as much about process as it is about story or music or even acting. So much to love about “[title of show]”! Not to give anything away, but “[title of show]” does have some success and then, it sort of just fades off. We see the four actors and Larry, the keyboardist, played so adorably by Kevin Mathie (also the show’s musical director), try to get their show back on track. In the meantime, we watch a very honest, funny–no make that VERY funny story of four people who are trying to get a show on Broadway. The music by Jeff Bowen, is incredible, using a variety of musical genres for the songs. The book by Hunter Bell is amazing. It’s really Hunter’s story we see. The actors are so spot on, I’d swear they were the original people in the show. However, I knew this wasn’t the case as the real Hunter Bell (who wrote and then starred in the show when it opened) came to this production. I met him and he’s as sweet as pie, and I could see from the twinkle in his eye and huge enthusiasm for this particular production that the Hunter in the show is a totally authentic Hunter from real life. This is refreshing. Austin Archer does a fantastic job as Hunter, and how awkward might it be to play the guy who wrote the book and then played it when [title of show] was first performed? If Archer was nervous, I couldn’t tell. Instead, he was funny, very physical, had great timing with all the comedy and sold every moment as Hunter. Jonathan Scott McBride has a voice that I could listen to all day long–strong, clear, delightful. His acting chops are just as impressive. As the composer Jeff Bowen, he is funny, but when he sees Hunter begin to sell out to make sure “[title of show]” is a success no matter what, McBride shows a fierce dedication to make sure Hunter stays true to the original concept. I could feel his alarm and even anger that Hunter was making selfish and even foolish choices. The women in the show were awesome and one of my favorite songs was “Montage Part 2: Secondary Characters.” For anyone who’s been almost a lead role, this song is especially meaningful. Shenefelt’s clear, multi-layered pipes and incredible range brought great drama and delight to this production. Darby-Duffin’s voice and her hilarious facial expressions made her so real, it made me feel like she was every fun friend I’ve ever had. Both women were believable and a real delight. Director Jason Bowcutt has his actors moving all over the simple stage and it made the show (90 minutes with no intermission) really clip along. I felt really happy during the production and I know it was in part to how Bowcutt had so much movement going all the time. With only four players, it could get stagnant and boring really quickly. The set, and the costumes (by Nancy Susan Cannon) also became topics of discussion in the show. I won’t tell you about them because it’s a funny bit and I don’t want to spoil it. But you’ll like it, I promise. I don’t want to give away the ending of the story, but if you search Wikipedia, you’ll know what happens to “[title of show].” Do yourself a favor and don’t look it up on Wikipedia. Just come see the show and you’ll find out on your own. The Sugar Space Studio Theater in Salt Lake City (Sugarhouse) is smallish, and opening night sold out, so I would recommend getting your tickets quickly. This is a top-quality show, very tight, and very enjoyable, and I suspect the shows will sell out. Note: if this was a movie, I’d rate it R. Don’t let this dissuade you from coming to the show, but there are a lot of F-bombs and discussion of adult themes–probably not for less than mature teenagers and up. This is actually one of the topics examined in the show–should it be “cleaned up,” and one I felt was explored rather interestingly. I’m not sure I would have made all the same choices Bell made, but I see where he’s coming from and those decisions are part of what make “[title of show]” a completely unique production.